2018 has proven to be a double celebration for the students, parents, staff and governors. Not only were the A Level results the best results the school has ever achieved in the history of the college but our GCSE results are also the best results the school has ever achieved as well. 100% of students at New-Bridge Integrated College achieved 5 GCSEs with over 90% of our year 12 students achieving 5A*-C grades. 42% of our pupils achieved A*/A in a range of subjects. Our 5A* -C grades including English and Maths remains significantly above the NI average for similar schools. 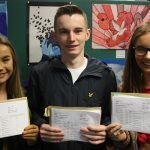 “We are delighted by the outstanding results achieved by our students which consistently outperform the targets set for non-selective secondary schools across Northern Ireland”. Our students have worked hard to achieve A*/A grades across a broad range of subjects offered at the college with over 50% of our pupils achieving these top grades in subjects such as Art, Child Development, Construction, Creative Media, Drama, English Language, English Literature, Countryside & Environment, Geography, History, ICT, Maths, Further Maths, PE, Polish, RE, Science, Spanish. 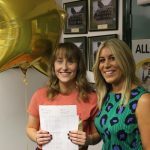 Our top student achieved 10 A* grades and is now progressing to sixth form to study Maths, Physics, Chemistry and Biology. Outstanding achievements for New-Bridge students! I would like to thank the dedicated staff at New-Bridge – teaching and support staff, for their hard work and commitment in supporting the range of abilities within the year group. We also thank the teachers within the Banbridge Area Learning schools who have contributed to the pupils’ success, through delivering Collaborative Courses. Our innovative curriculum design provides our students with a broad range of GCSE courses which suit a range of learning styles and this balance of traditional and vocational courses have enabled all our students to celebrate success at all levels; we are delighted that their GCSE grades now provide them with progression routes, whether that be returning to New-Bridge to study 3 or 4 A Levels; or to progress to SRC and SERC to follow a more specialised vocational route. As an integrated all ability school New-Bridge our ethos places a special emphasis on each student achieving their full academic potential. So congratulations to all our GCSE pupils – we are very proud of their achievements. One of the many qualities of this college is the strength of the relationships that exist between students and staff at New-Bridge Integrated College – we pride ourselves on the relationships which are built on trust, respect and the belief that anything is possible. We appreciate the ongoing support our parents have shown in working with the college to create strong partnerships, which have been key in helping our students achieve their full potential. These excellent results reflect much more than just intelligence – they show clearly the commitment and the strength of character that each of these young people has. We also appreciate the hard work, commitment and support of parents; the partnership between home and school is vital. 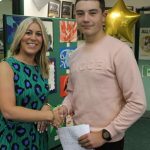 We wish all our students the very best of luck with their future studies and thank our parents for their continued support over the years and we look forward to welcoming both parents and pupils back to school for our Senior Prize-giving on Thursday 20th September 7 pm where they will all be formally congratulated on their results.